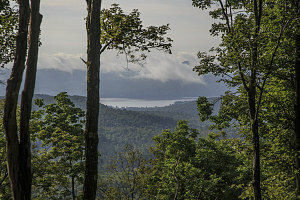 Hoffman Mountain has, for nearly two hundred years, captured the imagination of those living and travelling to the relaxed northwoods destination of Schroon Lake, New York. 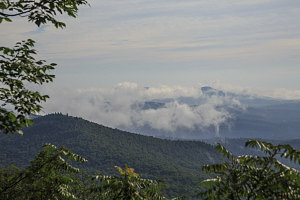 It is visible from much of the lake as a broad, high, forested peak supported by elegant, prominent ridges. 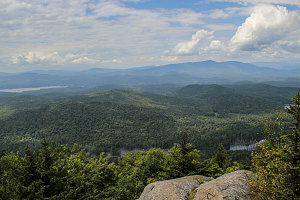 Although not one of the Adirondack High Peaks famed 4000-footer list, Hoffman Mountain is still fairly high in the ranks of the peaks of the Southern Adirondacks, where it is located. 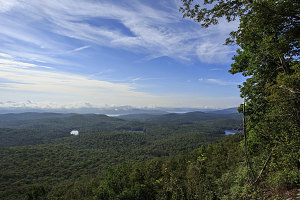 Hoffman Mountain - formerly called Schroon Mountain - was first captured by the famed naturalist painter Thomas Cole. Using a style that he became renown for, he painted many romantic and somewhat idealized images of the wilds of America's northeast, and Schroon Lake and nearby Schroon Mountain were no exception. 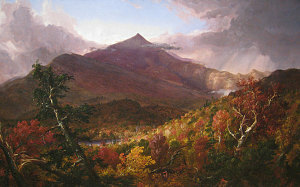 In the 1830s, he painted several stylized scenes of the Schroon Lake area, and of Schroon Mountain - our modern day Hoffman Mountain. "I don't know you - but I love your website. I'm originally from Montreal and spend my summers in Schroon Lake in the Adirondacks - use your site to pick the mountains to climb each summer." After this initial contact, Andrew expressed to me his lifelong desire to try and climb Hoffman. He had been a bit hesitant about charting a route up on his own - for there is no maintained trail to the top, nor is there any sort of easy herdpath. He wondered if perhaps I might be interested in accompanying him and his friend Larry. Larry and Andrew had been discussing the possibility of an attempt on Hoffman for some time. 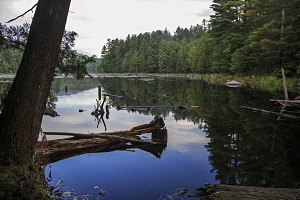 In fact, the Schroon Lake neighborhood in which they spend their vacation time became well-acquainted with this dream of theirs, and over time the objective took on a somewhat legendary air. Apparently several people in the area had reservations about whether they could or would ever climb the peak. Talk was (and is) cheap, and this seemed like a noble but quite achievable challenge. Having done a number of less-than-agreeable successful bushwhacks myself, I imagined that a climb of this peak should indeed be manageable. 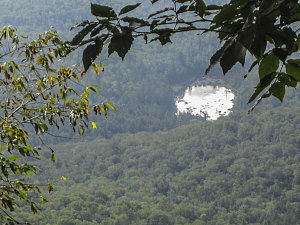 Plus, this would be a new Adirondack summit for me. I agreed to accompany them on their quest. An original climb date of July 28th was weather-delayed to Sunday, August 12th. 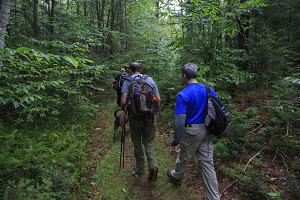 During the run-up to the climb, our research involved us contacting Julie Moran, a fellow hiking companion who has extensively climbed peaks in the northeast, and who also had Hoffman in her sights as part of the Adirondack Hundred Highest list. She asked if she (and her dog Mike) could join us. 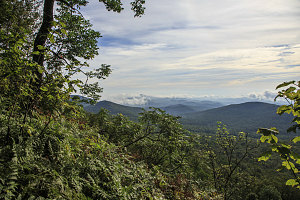 Hoffman Mountain rises to a height of just over 3700 feet. 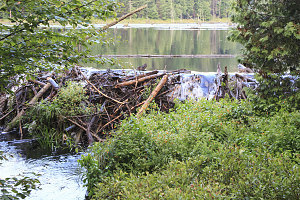 As mentioned earlier, the mountain has no maintained routes to its summit, nor does it have any extensively-used herd paths. There are no trails that penetrate very high up its flanks, which means that any ascent is going to involve a large amount of off-trail travel. In other words, bushwhacking. Research on the internet revealed surprisingly few posts about climbing Hoffman, and the posts that did exist contained limited information. 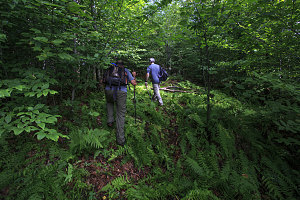 We did glean, however, that accessing the peak via its south ridge seemed to hold the promise of relatively light-weight bushwhacking. 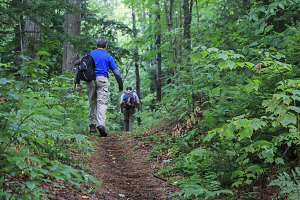 This was very appealing to us, because off-trail bushwhacking in the Adirondacks can often be notoriously difficult. This, then, would be our intended ascent route. 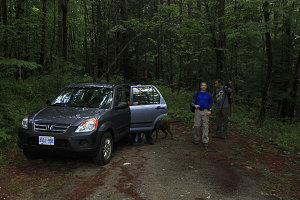 We arrived at the Big Pond trailhead along county highway 24 - a.k.a. Hoffman Road - shortly before 6:30 a.m. The big Pond trail allowed us to walk a portion of the approach distance on a nice, maintained path. 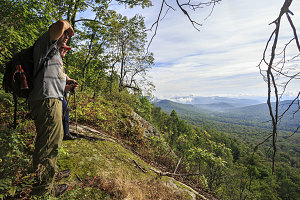 At a point about a mile and a half in, the trail crossed only a few hundred feet from the toe of Hoffman's south ridge. 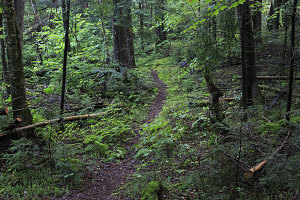 From here, we would turn off the trail and begin the long climb up the gradual grade of the south ridge. It was a moderately warm but humid morning. The weather forecast for the day had been somewhat uncertain, with a 30% chance of afternoon thundershowers. For the time being, all we seemed to have was a bit of low-lying cloud that (we hoped) was beginning to dissipate. After signing in at the trailhead, we began the first part of our quest - the easy part - along the mostly-flat Big Pond Trail. 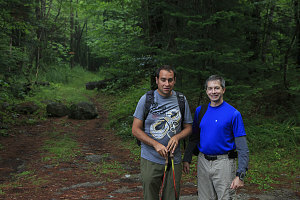 Apart from a few wet spots, the trail was in great shape, and we spent much of the first thirty minutes getting to know each other (this was the first real face-to-face time we had since first becoming acquainted online). 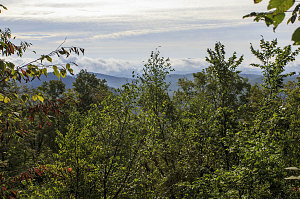 Shortly before 7:30 a.m., we arrived at the point along the Big Pond trail that was closest to the toe of Hoffman's south ridge. 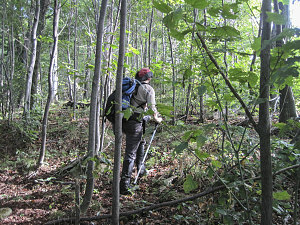 The forest in the direction of the ridge was ideal for bushwhacking - very open and with very little understory - a welcome sight. We looked for any signs marking the start of a herd path, and we did notice some pink flagging tape in a few spots. However, none of these locations seemed to have anything in the way of a discernable herd path. 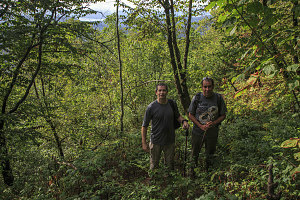 So, we picked a spot on the map closest to the ridge's toe and started off into the woods. The bushwhack had begun! The short descriptions we had seen of ascents via Hoffman's south ridge mentioned that the brush was more open if one stayed slightly to the right of the ridgecrest. As a bonus, there were supposedly some nice lookouts along the way. 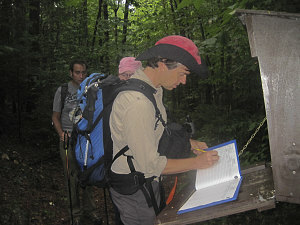 The elevation at our bushwhack start point along the Big Pond trail was approximately 1350 feet. 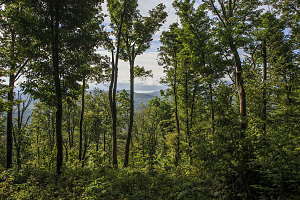 For the first three hundred of elevation beyond that, it didn't seem to matter what side of the ridge we were on, because the forest was uniformly open. 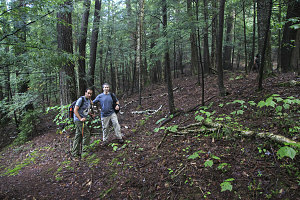 Soon, though, a light understory of foliage developed, and we made more effort to stay on the eastern (right-hand, facing upwards) side of the crest. In a very few spots, we could faintly see the existence of a herd path. 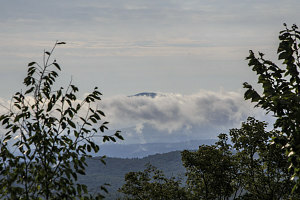 And, at about 2,000 feet of elevation, we reached our first limited lookout to the east, where we were able to see the layer of morning cloud - now below us - burning away. We came upon a succession of better viewpoints as we ascended up the narrowing ridgecrest. 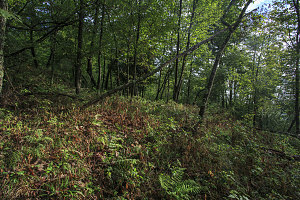 The foliage between the viewpoints varied from light leafy brush to open patches, floored with ferns. In other words, easy bushwhacking. 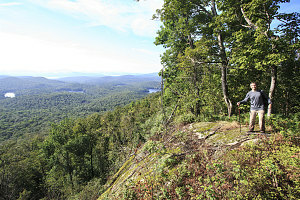 We also began to get ever better views of Schroon Lake from these lookouts as we ascended - something that Andrew and Larry found very exciting. Their long-standing quest to climb Hoffman was now becoming a reality!